These gardening tips will help your plants survive the summer months, any time you’re facing a drought or a long spell of hot weather. Like our other vegan garden tips, they are simple, straightforward and easy to put into practice. Helping your plants thrive is often a case of proper planning, placement and soil fertility. A strong plant can better withstand the stress of high heat and dry weather. So fertilize the soil well before planting using organic compost and other sustainable stock-free fertilizers. You can also give your plants a boost with liquid fertilizers (like water soluble seaweed powder) a couple of weeks after planting, or in times of stress. General tip: While liquid fertilizers are great, it is best not to overuse them. Liquid fertilizers (even organic) feed plants directly instead of supporting the soil food web. The soil food web (simply put) is the network that makes nutrients (already in the soil) available to your plants. It is important to protect and nourish this system with organic matter whenever possible, to ensure long-term soil fertility. 2. Choose perennials, heat resistant crops or plants with an extensive root system. Many annuals have shallow root systems that dry out easily in the heat of summer. By choosing plants with a hardier root system (biennials (produce for two years), perennials, heat resistant crops, etc.) you’ll start your summer garden off on the right foot. Pros of heat resistance crops: Less watering = less money spent on water and less work during the heat. Pros of planting perennials or biennials: You will be investing in the future of your garden instead of planting for one growing season at a time. When planting from starts: Create a small dirt moat around each plant (slightly larger than the drip line, where the leaves reach out to). This channels water towards the roots when the plant is watered or when it rains. This is a particularly good idea if you are working with compacted or sunbaked soil. When direct planting from seeds: Dig a small channel 1-2 inches deeper than the recommended depth for the type of seeds you are planting. Sprinkle the seeds in the channel and cover with the appropriate amount of soil making sure there are still ridges (of soil) on either side of the seeds, to channel water downwards. Shade cloth can be essential during the summer months. 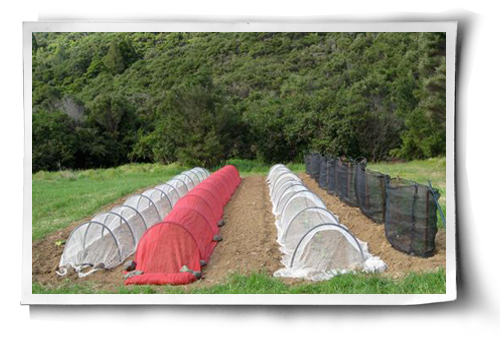 You can use it to protect young fragile seedlings/starts or give larger, more established plants a break from the heat. Shade cloth is available at many garden, home and department stores. There are different grades of “shade” available, depending on the intensity of the sun you are attempting to partially block out. At the same garden supply stores you should also be able to find metal hoops (semi circles) that can be placed over your garden beds to prevent the shade cloth from touching or damaging plants. When it comes to retaining fertility and moisture in your soil, mulch is on your side. Mulch can attract slugs and other gastropods, but it also protects the soil from UV light, as well as the heat of the sun and compaction, while helping the soil to retain nutrients and moisture. Different mulches: You can use grass, hay, newspaper, weed-mat and cardboard as mulch. General tip: Exposed soil is never a “great” thing. There are times you need to work the soil or leave soil exposed to the elements (starting a new seed bed etc. ), but whenever possible keep your dirt covered with mulches or ground covers. The worms, organic matter and microorganisms in your soil will thank you. 6. Use water catchments to save rainwater. Even if you use mulch, shade cloth and/or plant heat resistant crops at some point you’ll probably have to water. So to save money and other valuable resources, use a water catchment to collect water when it rains. This will give you a free water reserve to use in the gardens during dry periods.